The teen who was shot in the head by her ex-boyfriend this week at their Maryland high school has died. Jaelynn Willey, 16, died at 11:34 p.m. Thursday night, surrounded by her family, the St. Mary’s County Sheriff’s Office said on their behalf in a statement on Friday. A teen-aged gunman is dead and two other students have been hospitalized after an early morning shooting at Great Mills High School in St. Mary’s County, Maryland. 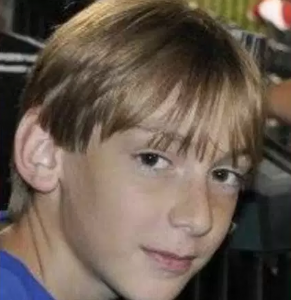 Authorities have identified the shooter as 17-year-old student Austin Wyatt Rollins of Lexington Park. He opened fire in the school at about 8 a.m., authorities said. Rollins was declared dead at 10:41 a.m. at the University of Maryland Charles Regional Medical Center in La Plata. Injured in the shooting were 16-year-old Jaelynn Willey, also of Lexington Park, and an unidentified 14-year-old male student. Willey is listed in critical condition at a trauma center in Prince Georges County. The male student is in stable condition at MedStar St. Mary’s Hospital. 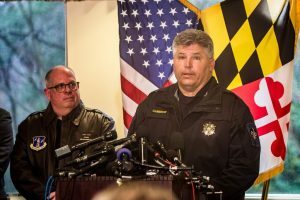 St. Mary’s County Sheriff Timothy K. Cameron said there is an indication that a prior relationship existed between Rollins and Willey. An investigation will determine if that prior relationship played any part in the motive behind the shooting, he said. The incident happened while students were mingling in Hallway F of Great Mills High School, authorities said. Cameron said the school resource officer, Deputy Blaine Gaskill, responded “within seconds” and exchanged gunfire with Rollins. Two shots were fired almost simultaneously. It is unclear at this time if the simultaneous shot from Rollins was being aimed at Gaskill or at himself. Rollins was armed with a Glock semi-automatic pistol. Gaskill is also a SWAT team member. Gov. Larry Hogan looks on as St. Mary’s County Sheriff Timothy Cameron speaks about the Great Mills High School shooting. (Michael Jordan BPE). Authorities confirmed it is possible that Rollins may have committed suicide. Cameron said a tourniquet was applied to the shooter at the scene. Rollins also received CPR. The school was under lockdown as students were evacuated one classroom at a time and bussed to a reunification center at nearby Leonardtown High School. Authorities asked parents not to respond to Great Mills High School but rather report to Leonardtown High School for reunification. “No parent should ever have to worry when they send their kids off in the morning to school whether they are going to come home safely or not. 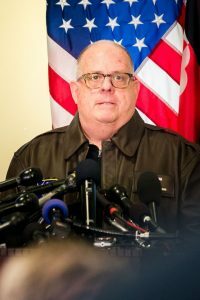 We need more than prayers,” Hogan said. In a statement by the St. Mary’s County Delegation about this morning’s school shooting at Great Mills High School, delegates asked for prayers for the injured, their families and the community. The Delegation remains committed to listening to the needs of the school system and local law enforcement to see what assistance the State can offer. “Our hearts go out to those injured and their families, and to the Great Mills community. We have been told by authorities the situation has been contained and students have been safely bused to Leonardtown High School. I send my deepest gratitude to the St. Mary’s Sheriff for the quick response and action,” said Delegate Deborah C. Rey in a statement. “I’m sick to my stomach hearing of the terrible news out of Great Mills High School this morning. I know that our young people and our entire community will need our love and support over the coming days and weeks ahead. Parents, hug your children a little tighter tonight and let’s pray the victims survive and recover,” said Delegate Matt Morgan. “It’s my understanding that we should be grateful for the quick involvement of the School Resource Officer, the Sheriff’s department, and the teachers and administration. My thoughts and prayers are with the students, families, and community,” said Delegate Gerald W. Clark. The shooting comes nearly a week after the students at the school held a walkout protest to support the victims of the Florida school shooting. In the aftermath of the mass shooting at Marjory Stoneman Douglas High School in Parkland, Florida, Hogan proposed $125 million in school security enhancements. The Maryland legislature is currently considering Hogan’s proposal. Cameron asked anyone with additional information to call 1-800-CALL-FBI.